Every kid remembers their favourite bike. Years later, you can still recall how the handlebars felt on your palms, how high the seat sat, and the force of wind and gravity, blowing your hair your hair while you stood on the peddles and rode swiftly downhill. When you’re buying a new bike for your child, you’re inspiring the same sort of memories you made with your bike years ago. Mountain bike manufacturers have gone to greater lengths in the past 10 years to make the sport more accessible to all types of riders—now junior can ride the trails with mom and dad on a bike that’s as good as one for an adult. Believe it or not, there are even mountain bikes for toddlers, that the little tikes walk alongside. Check out our Buyers’ Guide for the best kids mountain bike below and then take a look at our Top 3 and see of any of these bikes are right for your child. When you’re buying a mountain bike for yourself, you’ll be considering different things than when you’re buying a bike for your child. Most obviously, there’s a significant size difference. Also, you want to make sure your child’s bike is the safest available. Safety is a primary concern when buying a bike for a young rider. It’s important to get a bike with hydraulic breaks (thankfully, the industry standard) to ensure the bike is going to stop when your rider tells it to stop. Disc breaks are also a feature to keep an eye out for as these will stop the wheels even quicker. Also, until your child rider is confident, make sure they’re wearing a helmet, pads and long sleeves to avoid injuries. Of course, they’re going to fall. Every kid falls off their bike—even you, remember? But when they do fall, you want to make sure they’re safe. Adjustability is another major concern when buying a child’s bike as opposed to buying a bike for an adult. For the most part, once you find the optimal seat placement on your bike, you leave it set there. For a growing child, however, this is a major concern. You want to make sure the bike is able to grow with its rider. Otherwise, you’ll be buying a new bike for your child every time they have a growth spurt. Sounds expensive! Lightweight frames are another consideration for a child rider. Think about it, if a bike is 30 pounds, and your child weighs only 70 pounds, the bike is almost half their weight! So finding a light bike for a child is particularly important because they are so small. Aluminium frame bikes are perfect for young riders as these allow for lightweight construction with a high-quality frame. Smaller wheels are going to be more common when looking for children’s bikes. If your child is less than 4 feet tall, they want a bike with 20-inch wheels. If they’re more than 4 feet tall, they want a bike with 24-inch wheels. Eventually, they’ll grow into an adult bike. But keep in mind that child riders will go through bikes faster than adult riders will since they’re always getting taller. Look for bikes with duel-suspension. While a hardtail bike might be more fun for an older (adult) rider, you want a bike that will absorb a lot of the impact of the trails so your young rider doesn’t take the force head on. Dual-suspension bikes are pretty standard on mountain bikes these days so it won’t be too hard to find. 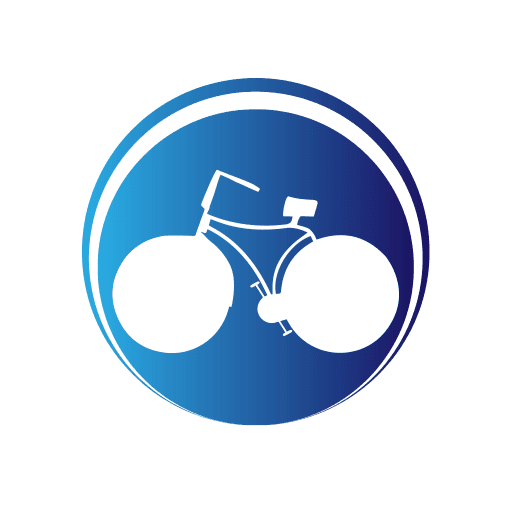 The suspension of a bike is one of the main criteria for determining the bike’s quality, so look for that in reviews you read about different models. Now, we’ve saved the best for last. The best tip we have for parents picking out a mountain bike for kids is this: ignore suggested age ranges! They don’t mean much at all. They’re going on the average height and weight of children at different age markers. Now, I’ve met plenty of children of all different types and weights—but believe it or not, we’ve rarely met a child who is just “average” for their height or weight. Who likes to think of their kid as average? Instead, measure your child. Use your sewing tape and see how long their legs, arms, and torso is. If there’s a store close to your house (Walmart, for example) measure your child on a mountain bike at the store. 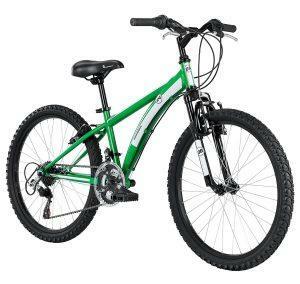 This Diamondback bike is our top pick for kids mountain bike. It’s designed for speed, durability, and quality. This bike is good on dirt, on asphalt or concrete and in practically any other situation a bike is needed. It’s lightweight, 37-pound frame is made from heat-treated aluminium alloy and stands up to the elements and a ferocious young rider. It’s got forked, dual-suspension to absorb shock and jumps on the trails—or potholes in the street. The linear pull breaks are strong, safe, and secure—and they’re easy to fix of a hard day of riding jostles them loose. The bike has a 21 speed drivetrain so it’s easy to get this bike moving fast. That’s why it takes our top pick for the best kid’s mountain bike. It’s fast, durable, and a great bike for growing riders—plus it comes with the Diamondback brand quality that’s been making mountain bikes for over 25 years. This 24 Inch Hardtail is a great bike for riding the trails and landing high jumps for the little shredders who want to ride fast and furious. Reviewers commend the bike’s adjustable seat, which allows growing riders to make sure they are always seated properly to reach the pedals. This 24 inch bike is great for older riders, ones who are over 4’6’’. With a welded, duel-suspension frame, the bike can hold up on uneven terrain. It’s got 21 speed ddrivetrainand can get you going fast. The bike is light, at only 26 pounds, and the larger, 24 inch wheel will get your child going faster than they were going on their old bike. Reviewers say this bike is fit for BMX racing after a minor tuneup. It’s got a high cost to quality value so it rounds our list as one of the best on the market. For around $100, the Kent makes an excellent budget mountain bike for kids. It’s got a 7 speed twist shift gear system. This is just enough to get young riders used to switching gears while riding the bike. It’s got welded, duel-shock suspension—a feature usually not available on a mountain bike in this price range. The duel-shocks are a feature your little rider will love, as they learn to ride the dirt trails and let the bike take the brunt of the shock. The bike is on the heavy side (36 pounds) and will help with balance for little riders. Sitting on 20 inch wheels, the Kent is perfect for small riders who are less than 4 feet tall. It has hydraulic hand breaks, tested for safety. Now, keep in mind, this bike is on the smaller side, so eventually, your child will need another bike. Also, reviews have commented that the sturdiness of this bike may vary. Some users report that the bike broke after heavy use, which might be right around the time your little rider has outgrown this bike. However, the combination of price and features still make this a great budget choice—especially since the lowered durability is outweighed by the fact that your child will grow and need a new bike. Buying a mountain bike for your kid is a fun experience for the whole family. They’ll be creating great memories on their new bike soon after you buy it. When you’re buying, keep in mind safety, adjustability, shock suspension, frame, wheels, and most importantly the height and size of your rider. 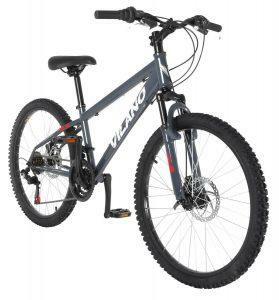 Our top three bikes are the Diamondback Octane for it’s high quality construction and adjustability. We also liked the Vilano Kids 24 inch Hardtail for it’s speed, racing quality, and construction. 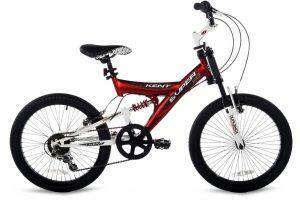 Finally, we choose the Kent Super Boys Bike as our best budget bike pick for it’s low price and wide array of features. Happy riding!